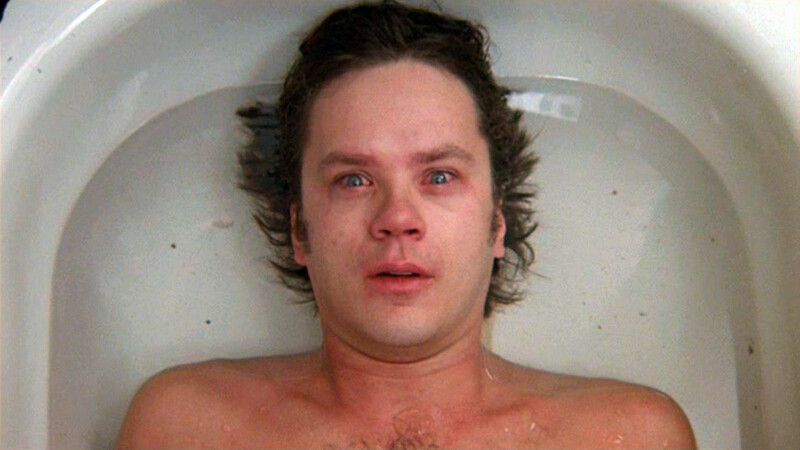 Tim Robbins plays a scatterbrained ‘Nam vet who believes that demons, real and figurative, are out to get him. Is it a government conspiracy, or is Robbins nuts, or both? He has sort of a mullet, that’s for sure. I hope you enjoy movies in which the protagonist suddenly wakes from a nightmare, drenched in sweat with a look of terror still on their face. Over and over. Because this is one of those movies. The film progresses with the jagged velocity of a bad LSD trip. There are tense quiet scenes that are interrupted by violent Vietnam flashbacks and demon action. You might get up to grab a beer while Robbins is being adjusted by his chiropractor and when you sit back down, he’s being stabbed by Charlie in a jungle ambush. The demons are great. Sometimes there’s just a reptilian tail subtly hanging out of someone’s trench coat. Sometimes, some guy in a car will jiggle around and morph into a demon. In one scene, Robbins is bobbing his head at a house party and everything explodes into demonic pandemonium like the orgiastic “lizard scene” from Fear & Loathing in Las Vegas. Imagine you work at the post office, have a mullet, and ate the brown acid and now that’s your life forever. When Robbins discovers that his war buddies are also haunted by demons, the supernatural element of the film settles down a bit and now we’re in an X-Files style government cover-up story complete with sunglasses-wearing guys in black suits and an abundance of car-bombs. Did the US government expose Robbins’s platoon to toxic materials that induce hallucinatory demon trips? Sweaty sleep-deprived Tim Robbins tries to get to the bottom of this. You aren’t really sure if it’s demons or the government who are ruining Tim Robbins’ life, so the movie keeps you guessing, which is good. Macaulay Culkin gets hit by a truck, which is okay. Points off for the most pompous/abrupt post-modernist cop-out ending I’ve seen in a while. This is the godfather of M Night Shyamalanian “twist” horror endings for sure.